Silo painting; like bulk storage tank and corrosion resistant tank linings, requires a highly specialized skill set. As industrial painting contractors Industrial Painting Contractorsspecializes in restoring your tanks and silos. We also clean and coat all types of storage silos. USDA, FDA, NSF, and other specifications strictly followed. It’s critical to remove the rust and peeling paint from the silo or storage tank by mechanical abrasion using sanding, blasting or wire brushing methods. 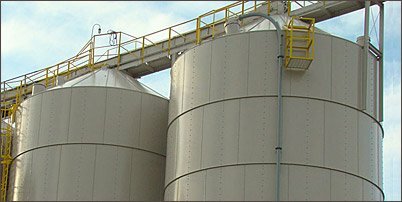 Prior to applying any type of silo painting or storage tank coating all surfaces are abrasive blasted or high pressure washed to a clean, sound surface suitable for coating. Rust resistant primers, epoxy or alkyd, are applied to assure corrosion resistance. It’s said that any painting job is only as good as the prep work, while that is true you must choose a final coating that is best suited for the job if you expect to get the results you are looking for. The type of coatings chosen must be able to withstand moist atmosphere exposure conditions. Our recommended finish coats are formulated with polyurethane, for durability, color fastness, and gloss retention. If you are interested in our painting and coating services, you have any questions, or you’d like to request additional information, please contact us, or fill out our online form.